A Place for People, and Occasionally, Pups. This website is not merely a blog to promote my book idea, Around the World on 80 Couches, but it is a project, and above all, a philosophy. For one moment, let’s discuss the couch. The couch is the most democratic of all common household furniture. Unlike the chair, recliner, love seat, or bed, the couch can hold three people without the need or expectation of intimacy beyond simple friendship. In fact, friendship need not even apply. This is the place where friends of friends first meet, first exchange ideas, and first discover mutual admiration for one another. This is the place where you invite guests to take a load off, and the place where you yourself relax after a hard day. 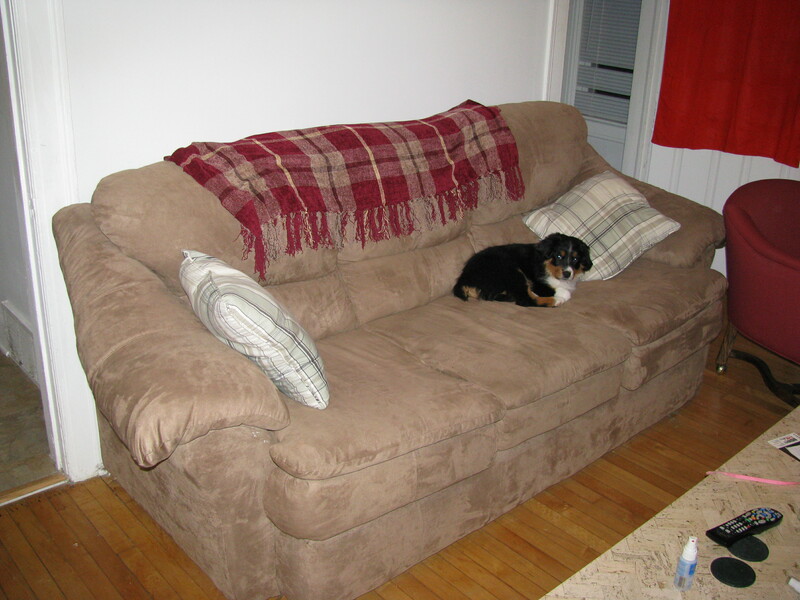 It is no surprise then that couchsurfing.org chose the couch as its symbol of good faith, hospitality, and trust. Over the last four years, couchsurfing has become ingrained into the very core of my being. I have both hosted and surfed, and the amazing part? Every experience is still unique. I have begun to recount these tales on my page, “The Sofasphere: Adventures in Couchsurfing.” I try to write about the best and brightest moments, but these only scratch the surface of the far larger picture. While there have been one or two surfers I could have done without, most of the surfers I’ve met have been amazing and endlessly interesting people. For the most devoted among us, couchsurfing is a way of life. It is this idea that we can help each other out and expect the same in return. All too often, the media tries to remind us of the danger in the world. Of course danger exists, but it is not the norm. Through couchsurfing, I have learned that most people are mostly good most of the time. And I’ve learned that by putting a little blind faith back into humanity, humanity will unquestionably give back. More and more, I find myself drawn to the eclectic online community of couchsurfers, and I have formed some of my most profound adult relationships through this site. In a discussion with Milwaukee Couchsurfing Ambassador, Courtney, she said, “Not all of my friends are couchsurfers…but most of them are.” It’s not that either Courtney or myself choose to only hang out with couchsurfers, but rather that this group is generally more interesting to be around. Throughout the years, I have met surfers who were doctors, lawyers, engineers, working for non-profit organizations, micro-brewers, couriers, students, horticulturalists, and countless other professions. These are ordinary folk, but they just happen to be a bit more adventurous, a bit more curious, a bit more trusting (and trustworthy! ), and most of all, a bit more fun. As of this writing, I have hosted over 70 surfers from 17 countries. There exists a strange and wonderful camaraderie between surfers, something not easily found in day-to-day life. We share travel stories, and often deep insights and secrets that we would not be comfortable sharing with any other than our closest friends. Why is this? Well, I guess couchsurfers have neither the time nor reason to awkwardly skirt social issues that might make others uncomfortable. I surfed with a gay couchsurfer who refused to “sanitize” his apartment (his words) of various male erotica around the house. He said he didn’t feel the need to put on a false front. This, above all, makes couchsurfing the “most real” of experiences. People can be themselves, and there is a mutual understanding of general acceptance. It is more “real” in other regards as well. When I’ve been traveling and I stay with a couchsurfer, I get to experience life as a local. No amount of scouring the internet or paging through a Lonely Planet can help the traveler to transcend the label of “tourist” better. Couchsurfers go to the local pubs, drink the local drinks, eat the local fares, and create a connection with the local community in a way that is almost impossible otherwise. When the media goes through great lengths to point out our differences, and we go through even greater lengths to generally avoid those with even the slightest of differences, it is nice to know that there is a community that still accepts and welcomes variety, and provides a safe playground for ideas, philosophies, and lifestyles to mingle. So, what’s better than one couch? How about 80 couches? And how about circumnavigating the globe while I’m at it? That’s the idea that I’m working toward. I want to do it, and I want to write a book about my experiences. That trip is still a year or so down the road, but I wanted to create this website to share my experiences in the sofasphere. –Originally written February 16, 2011. Revised February 15, 2012.